I find it hard to put into words my feelings after work today. Despair, regret, frustration, confusion... none quite get it. It actually is worse in that picture than it is now (the area wasn't completely flooded) but it was still rather squishy. I was doing about 30 when I saw the going get rough and braked. I slid roughly 100 yards and didn't move again after that. I think it would have been ok if the front passenger wheel hadn't sunk up to the rim. Even in 4L it would rock a bit but just wouldn't get out. I had a 2x6 in the bed and tried to wedge that in there, but it was just too soupy. The tires on that truck are clearly not meant for this type of activity. I've never been in a situation like this and had no idea what to do. I called my dad, who retrieved a tow strap and began en route in his RWD 05 Silverado. His expedition was unsuccessful. 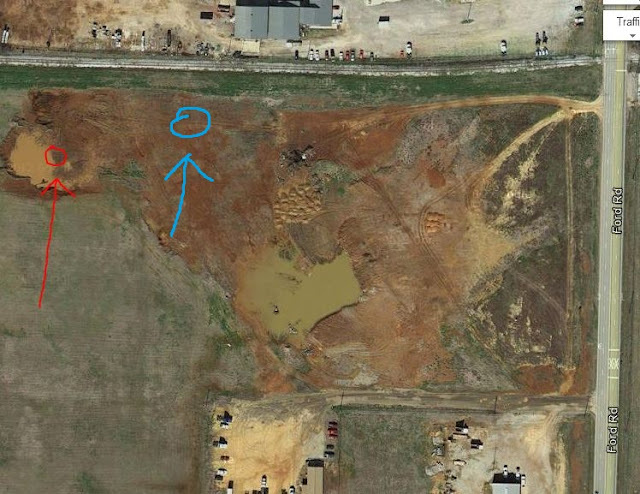 Dad got to approximately to where the blue circle is before his truck nosed into the mud and wouldn't move anymore. At this point we balked and called a wrecker, who would be there in an undisclosed amount of time. During this time we flailed about madly for roughly an hour and managed to get his truck free. By this time it's 7pm and dusk. The wrecker arrived and was like "lol, I can't go back there" and left. This is where I reached the very depths of the pits of despair. All hope was lost. I was unwilling to accept that I'd have to leave the truck out there for who knows what to happen to it... but could see no other option. Eventually the guy that owns the land drove up. Luckily, he was a decent fellow. After talking to him for a while he said that he'd pull me out for $100. Great, done. He retrieved a dozer and yanked the truck out. At 8 I was back at home, 3 hours later. 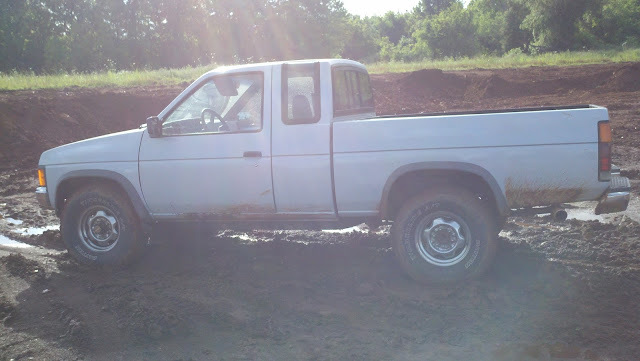 What I'd intended to be a 10 minute 4x4 check turned into a 3 hour debacle from the pits of hell itself. Roads are good ol' guys, and from now on, I believe I will use them. Awesome, your truck looks surprisingly clean. That guy was a flaming dickhead for charging you $100. Around here people would have pulled you out just to tell people about it. Remember next time not to go muddin' alone. At least he didn't file charges or anything... Yeah charging $100 was pretty crappy, but I'm glad just not to have been arrested. Definitely never doing that alone again, if at all.